Sometimes when looking for the toilet it is very difficult to find one that will include good features and reasonable price at the same time. Of course everyone wants to buy once and use it for at least a few years rather than having to change it with a new one in less than a year. We all want quality, durability and reliability. And speaking of these 3 main features means speaking about the Kohler Wellworth. 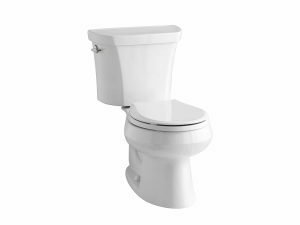 The price of this toilet is about 200 dollars which makes it one of the most affordable among all models and brands. Though being cheap doesn’t mean being of a bad quality. On the contrary it is considered to be very durable with much better features than even some more expensive models. The design of this particular toilet is very simple with elegant lines which make it suitable almost for every bathroom. The first and foremost its advantage it can boast of is the design of the trip lever. This special design was made to save water thanks to a dual flushing option. If you need to flush some liquids than a 1.1 gallon flush lever should be used. Another lever will get a 1.6 gallon flush to remove some bulky stuff. In such a way using different flush levers, will help you save a lot of water that is good for environment from the one hand and for your budget from the other hand. Yet the most pleasant its pluses are the price and the money you will save with double-flushing technology. Having counted, a person saves about 100 dollars per year using this feature. Moreover, this fact literally means that the price for the toilet will be paid for itself in 2 years. The maintenance is very simple – using special cleaning dispensers will be enough. SHALL I PURCHASE THE KOHLER WELLWORTH? The Kohler Wellworth is definitely worth buying. Not only because it is cheap though qualitative but also because of its multiple features like clog-free design, for example. The clogging is one of the main problems when dealing with toilet issues, yet it is absolutely not an issue for the Wellworth even when some foreign objects get inside the toilet. Avoiding any problems with clogging even the top of the tank is designed in a flat and freeway so that the items could be stored. The seat of this particular model is standard, to be exact 12” inches. Speaking frankly this toilet is a real finding and it is really hard to find some disadvantages in it. Even the trusted customers from Amazon.com leave only positive reviews and feedbacks. Therefore, why not give it a try?